A great way to introduce kids to scuba diving is the Bubble maker program (which is truly as fun as it sounds). In this underwater adventure, children are taught to breathe underwater using scuba gear (blowing bubbles) and are given a basic understanding of using the scuba equipment in the swimming pool. So ditch the typical kiddie birthday party this year, for a cool underwater themed party instead. 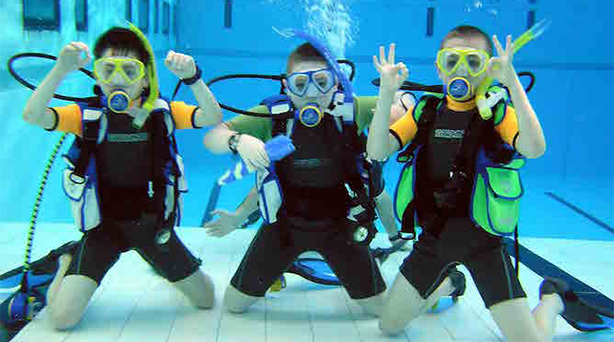 There’s no cooler giveaway than a picture of your child and friends, kitted up and having a blast underwater! Parental permission and presence is mandatory for every participant. While no prior experience is necessary, kids must be comfortable in water. The package per child, includes full equipment rental, pre-briefing and training, a half hour session in the pool as well as photographs and a short video. Additionally, If you need budget accommodation, hotels. Book your stay and dive package, here. 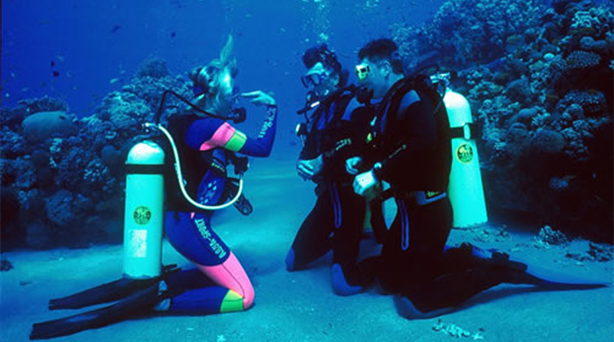 The scuba diver course is ideal for those participants who are not that comfortable doing a full 200 m swim (which is mandatory in order to complete an Open Water Course). On doing this course you will be able dive to a maximum depth of 12m/40 feet under the direct supervision of an instructor. During this course, you will be taken through a classroom session, followed by 3 pool training sessions and 2 dives in the open sea. The package includes a log book, scuba equipment rental, pool and boat charges, water and snacks on the boat, certification and instructor fee. It is mandatory for every student to be comfortable in water and be able to do a ten minute float. Are you ready to experience the freedom of diving on your own? Then it’s time you took your first open water diver course. 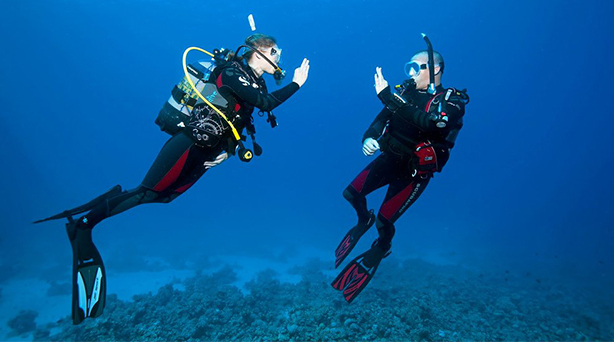 The Open Water Diver course equips student divers with the knowledge and skills required to dive with a buddy, independent of any supervision to a maximum of 18m/60 feet. Age: 10 years and above. It is mandatory for every student to be very comfortable in water and do either a 200 m swim or a 300m snorkel. Can’t get enough of being out in the open water? The Advanced Open Water Course should appeal to the adventurer in you. 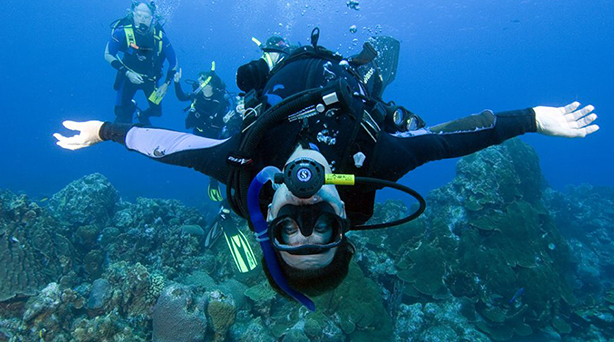 Learn how to navigate underwater and dive to a deeper depth. Choose from a myriad of skills to perfect. 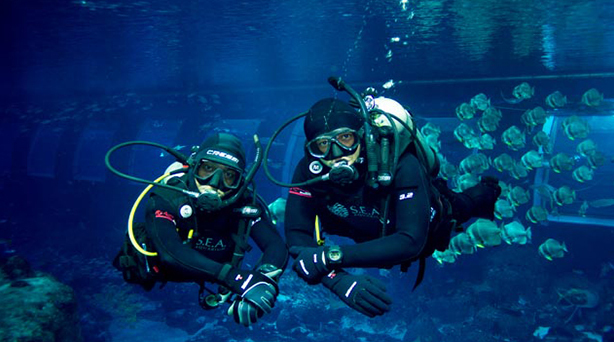 You can choose to learn more about the marine life underwater, perfect your buoyancy skills. This program consists of 5 open sea speciality dives – the mandatory Deep and Underwater Navigation dives as well as three elective dives. Day 1 entails a diver skills assessment, followed by the Underwater Navigation Dive and Wreck Dive/elective dive. Day 2 is action packed with three dives: the Deep Dive and two electives. 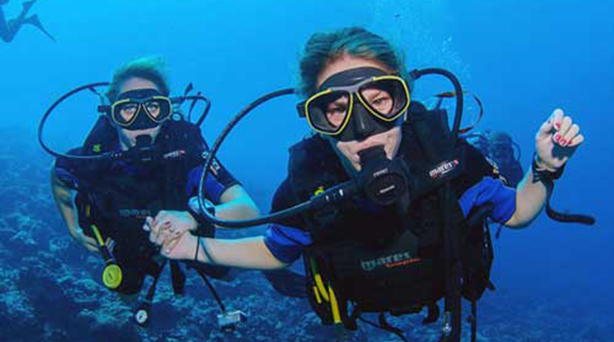 Student Divers can chose from a number of electives. Pre-requisite: Participants must be PADI Open Water Diver certified or possess an equivalent SSI/CMAS/NAUI/IANTD/BSAC certification. The course package includes scuba equipment rental with compass and SMB, boat hire charges, water and snacks on the boat and certification. Come discover the waters of East coast and dive amongst the wonderful marine life endemic to the area. Discover the beauty of our man-made reef which is now home for more than 100 species still raising because of the conservation and reef building around it . And if you are lucky you may even spot an elusive whale shark or sea turtle. Pre-requisite: Participants must at least be Scuba Diver certified or possess an equivalent or higher PADI/SSI/CMAS/NAUI/IANTD/BSAC certification. Emergency First Response training teaches you how to respond with confidence when faced with a medical emergency. Course participants learn simple steps for emergency care and practice applying those skills in an appropriate manner. 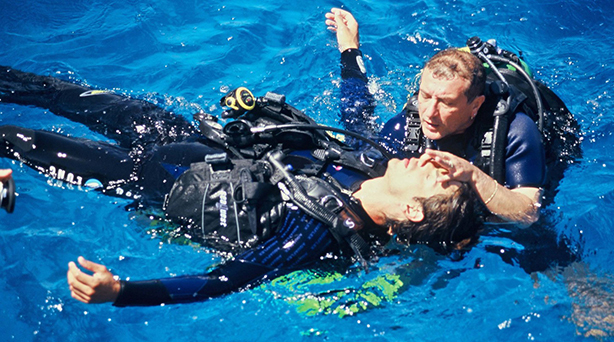 EFR courses meet the CPR and first aid training requirements for the rescue diver course and all professional-level ratings. The PADI Rescue Diver course as the most challenging, yet most rewarding course they’ve ever taken. Why? Because you learn to prevent and manage problems in the water, and become more confident in your skills as a diver, knowing that you can help others if needed. During the course, you learn to become a better buddy by practicing problem solving skills until they become second nature. Plus, the course is just fun – it’s serious, but still allows for lots of laughter in between the focused learning. Age: 12 years and above. Prerequisite: Participants must be PADI Advanced Open Water Diver certified or possess an equivalent SSI/CMAS/NAUI/IANTD/BSAC certification; and must have an up to date internationally recognized First Aid qualification completed within the last 24 months (You could do this with us with an EFR course). 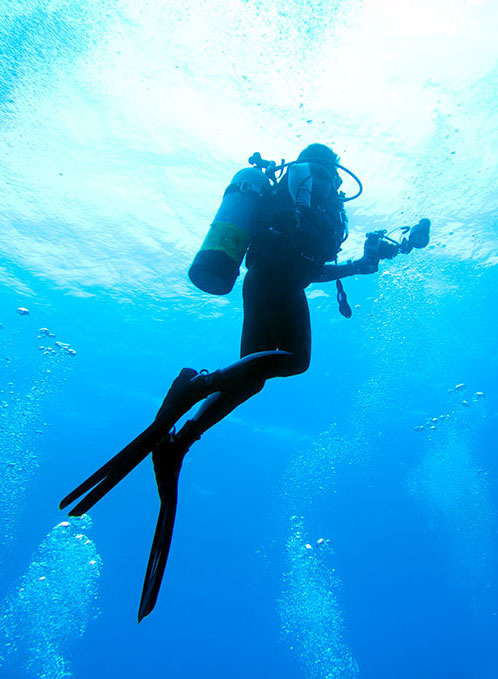 A dive professional certificate program is your first step into the world of professional diving. Join an elite group of divers at an international leadership level. The course, providing all pre-requisites are met, Internships are preferred and offered to deserving candidates. Being a leadership level program, it requires a greater commitment and passion than the non-professional level ones. Each individual is different and so the course is customized to offer candidates the ideal training for the dive industry. Training fees will include study material (instructor manual and slates) , a set of rental Aqualung dive equipment, all dives required to complete the course, boat hire charges with snacks and water. For pricing details, connect here.